China on Monday held a celebration rally to mark the successful launch of the nation's 2nd lunar probe Chang'e-2. Chinese President Hu Jintao gave a speech. Chang'e-2 was carried into lunar orbit by a rocket, and only corrected once during the transfer from earth orbit to lunar orbit, so a large amount of fuel will be left after its mission, the vice chief-designer of BACC said. Chang'e-2 blasted off on a Long-March-3C carrier rocket from the Xichang Satellite Launch Center, in southwest China's Sichuan province on Friday. 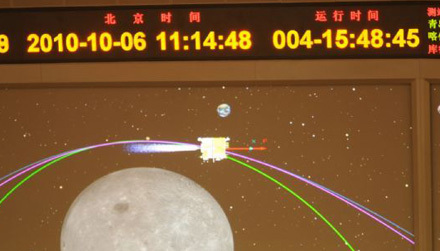 Chang'e-2 was maneuvered to correct its trajectory on the earth-moon transfer orbit Saturday. Scientists successfully activated the attitude control engines on Chang'e-2 and trimmed the satellite for the first time on its journey, according to a flight control official in Beijing. If lunar satellite Chang'e-2 sends back high-resolution photos of the Bay of Rainbows, the mission can be deemed a complete success, said the chief designer of China's lunar exploration program Friday. China's lunar probe Chang'e-2 was successfully launched, control center at the Xichang satellite launch site in southwest China's Sichuan Province announced Friday. Chang'e-2, China's second moon probe, has entered the earth-moon transfer orbit as it separated from the carrier rocket, the control center said Friday. China's second unmanned lunar probe, Chang'e-2, blasts off on Friday, inaugurating the second phase of the country's three-step lunar exploration program. A comprehensive examination has shown the Long March 3C rocket is in normal and sound condition for carrying the satellite Chang'e II, China's second lunar probe, to its planned orbit in three hours, the launch headquarters said. Three maritime monitoring vessels have arrived at a designated area in the Pacific Ocean to track the journey of the Chang'e II satellite, China's second unmanned lunar probe.